Ranay, flight attendant aboard Air Force One calls her husband, Greg, as the plane is going down. She says they're under attack by Wonder Girl and Supergirl, who may possibly be working for the Amazons as part of their invasion. Greg is in Washington, D.C., which is also under attack by the Amazons. He tries to calm Ranay down when a loud explosion heard over his cell phone cuts the call off. Supergirl, meanwhile, single-handedly (okay, she actually used both hands) lands the crashing Air Force One. Apparently three hours previous she'd tried to broker a peace meeting between the President of the United States and the Amazon queen, and it resulted in this attack. She rips her way into the plane to check if everyone is okay, finds Wonder Girl tending to the President, and gets blamed for the attack by the secret service. Before she can worry about that any further, a squad of Amazons bears down on the plane and she rushes to confront them. Back on the streets, the Amazons are running through the streets, attacking military and civilians alike. They make short work of some military resistance, when Greg (an ex-marine) fires a rocket launcher into their midst, takes up a machine gun and tries to protect the innocent people around him. Kara, meanwhile, is in the thick of battle with a different set of Amazons overhead. 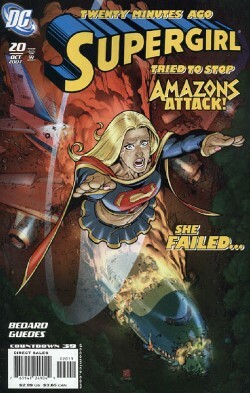 One of the Amazons takes aim and fires, and the arrow hits home in Supergirl's side, sending her spiraling out of the sky, but not before using her heat vision to set her attacker on fire. People gather around Kara, unsure of what to do, when Greg walks up and rips the arrow from her side. Greg wonders how it could have possibly hurt her, and Kara explains it must be magical. Greg discreetly saves the arrow for later, unsure whose side Supergirl is really on. Greg questions Kara about Ranay, who mentioned Supergirl was attacking the plane and wants to know if Kara killed his wife. She tries to explain what really happened, but before she can the burned Amazon has called in the heavy artillery... a gigantic Cyclops, which is tearing through the city. Supergirl flies up to confront it as Greg tries to get the other people to safety. As the Cyclops' giant hammer comes down on Greg, Kara swoops in to stop it. She succeeds, but soon learns that it, too, is magical and she takes a heavy beating. After one particularly rough crash into the street, Greg realizes that since the Cyclops is magical in origin Supergirl is going to have a very tough time defeating it. He gives her the Amazonian arrow that he saved, telling her that the Cyclops can't hit what it can't see. One burst of super-breath later and the arrow is lodged squarely in the Cyclops' eye, enraging the Amazon warriors. Using only its hearing to track Supergirl, the Cyclops swings wildly and ends up crushing his Amazon allies before Kara knocks it down for good. Kara returns to Greg and thanks him for saving the arrow, which is when he confesses that he'd originally saved it to use on Kara herself. Kara apologizes again for Ranay's death, and tries to explain that she was only trying to help. She thought if she could just get both sides in the conflict talking, it would make things better and with all her power she felt she had to try and do something. Greg relates a war story of his own from his time in the marines, and tells Kara that all the good in the world can't make up for the guilt she feels, but that's probably a good thing, and it's only bad if the lessons learned from the mistakes are forgotten. In the sky, Superman watches silently. Just then, Greg gets a call on his cell phone from Ranay, who it turns out survived the crash after all. Story - 5: I would have liked to see some interaction with Superman in this issue. I've seen enough of him hovering silently and the two of them never talking, but it's a new writer and I'll give it time. I really do long to see Kal and Kara together, though, and I surmise I'm not the only one. I wish this wasn't a tie-in issue, I wish it could have been forging ahead on its own self-contained storyline in an attempt at what I'd call a "soft reboot" of the character. But that's not what we got, and for a Countdown tie-in issue this also functions aptly enough as a stand-alone. I'd like to score this a 27. Steve only lets us score up to 5, though, so there it is. But to Mr. Bedard, I'd just like to say that I have 22 more points with your name on them. Just let me know where to send them, it's the least I can do. I've waited two years for this issue, folks, because there is just no comparison. None. This issue and what came before are like black and white, night and day, apples and... PCs (you thought I was gonna say oranges, huh? Well I sure fooled YOU). And for as much as I just want to forget the previous 19 issues and pretend they never happened (and the story of this book seems to do just that, and rightly so), Mr. Bedard makes an excellent point in that the mistakes of the past are best learned from and not forgotten. I'm not so sure any of us would ever make the sort of mistakes that were made in the previous issues of this book, but hey... if they happened once, they can happen again, and those that forget history are doomed to repeat it. I am full of philosophical mumbo-jumbo nonsense, listen to me opine! The point being... yes, let's not forget how horribly this book was mishandled, but let's do try to put it out of our minds for, as far as I'm concerned, this issue is MY "Supergirl #1". Thus begins the story of Kara Zor-El, a character worthy of the name and the uniform she wears. This Kara didn't spend a second pining over, and being defined by, any boys. This Kara didn't spend a single second on self-pity. This Kara didn't whine. Or pout. Or play the victim. This Kara... she tried to help. She made a BIG, HUGE, COLOSSAL MISTAKE. And then? Then... she admitted it. And tried to fix it. And it pained her when she couldn't make everything right, because she wanted to. And she was intelligent, too. She wanted to help, but she messed up and she knew it. And then she tried to make amends. She was selfless, she was brave, she was strong, she was vulnerable, she was heroic, she was real. She wasn't remotely perfect, but she was good. She had compassion and caring and flaws... sweet, beautiful flaws that made sense for her character and in context with the story. This is what I've been waiting for. This is what so many of YOU have been waiting for. THIS, my friends, is Kara Zor-El. Art - 5: The two comics I presently review for this fine upstanding website ("Supergirl" and "Supergirl and the Legion of Super-Heroes"), both now have an art style tending more towards realism and less cartoonish or what you'd consider "typical" comic book art. I enjoy a wide variety of styles. Cartoonish art can be awesome, like Barry Kitson's work on Legion, which was spectacular. But I must say I'm enjoying this surge of realism, especially in this issue. Kara (for the first time ever in her own comic!) looks like a real living person. She's not a perfect twig of a Paris Hilton-clone supermodel, she looks like an actual living, breathing person. And admit it, we all know Paris Hilton is leader of the army of undead... just look at her! She shoulda ate more of those bologna sandwiches while she was in prison, clearly. And Kara's emotions and feelings were all over her facial expressions as clear as day. The page 12 splash of the Cyclops attacking was amazing, and just look at Kara under the hammer on page 14, or her pose in the bottom right panel on page 19. Yessir, folks... this art kicks my heiny to next month. Oh no way... Ralph Macchio?! Cover Art - 5: AWESOME cover. Kind of sad, though, what with the tears and the burning flaming wreckage of Air Force One. Haw! I made a funny. There are way too many words on this cover, which for some reason felt the need to set up all of Mr. Bedard's exposition for him. Tsk tsk, DC! Let the writer's write and let the cover art... cover? But, looking at the whole picture, if the WORST thing about this entire issue was too many words on the cover, I'll take it any day of the week.